This is an all weather location so the meet will be on rain, hail or shine. 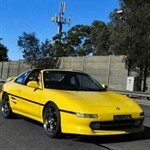 All MR2 owners are welcome to attend!! We will also occasionally organise a drive for food to a nearby location or a cruise after the meets, all info and regular updates will be in this thread. November meet is tomorrow night everyone! I wont be at this one either. Still fixing the thermostat and blown HG issue. Fingers crossed for the December meet. Not for me this month, I'm 2-less, she's at the mechanic for some bits & pieces. Just coz the two is in for some repairs doens't mean it forgoes from you attending. Are the wet weather provisions kicking in? Looks to be that way, bit of light rain at my place now although i'm not near Rhodes.